Is it chicken at all? It has come to the attention of THE UNCOVEROR that a letter is circulating the internet, accusing the former Kentucky Fried Chicken of shortening its name to KFC, because it no longer serves chicken. The letter accuses KFC of using meat from a genetically engineered mutant bird-like creature. We decided that we needed to investigate. Here is a copy of that letter. KFC has been a part of our American traditions for many years. Many People, day in and day out, eat at KFC religiously. Do they really know what they are eating? During a recent study of KFC done at the University of New Hampshire, they found some very upsetting facts. First of all, has anybody noticed that just recently, the company has changed their name? Kentucky Fried Chicken has become KFC. Does anybody know why? We thought the real reason was because of the "FRIED" food issue. It's not. The reason why they call it KFC is because they can not use the word chicken anymore. Why? KFC does not use real chickens. They actually use genetically manipulated organisms. These so called "chickens" are kept alive by tubes inserted into their bodies to pump blood and nutrients throughout their structure. They have no beaks, no feathers, and no feet. Their bone structure is dramatically shrunk to get more meat out of them. 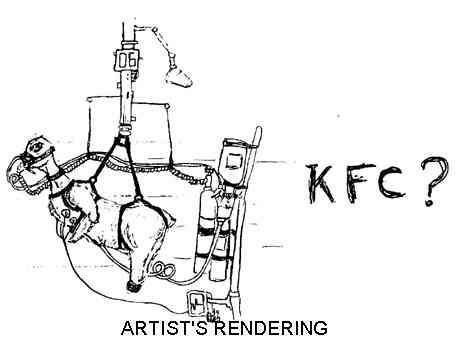 This is great for KFC because they do not have to pay so much for their production costs. There is no more plucking of the feathers or the removal of the beaks and feet. The government has told them to change all of their menus, so they do not say chicken anywhere. If you look closely you will notice this. Listen to their commercials, I guarantee you will not see or hear the word chicken. I find this matter to be very disturbing. I hope people will start to realize this and let other people know. Please forward this message to as many people as you can. Together we make KFC start using real chicken again. THE UNCOVEROR contacted KFC's national Headquarters, who issued a total denial. No one at University of New Hampshire could be reached for comment. We decided that we needed to investigate this in depth ourselves. After some digging, we found a KFC employee who provided us with samples of the chicken used in sandwiches and tenders. Upon request, we are not publishing his name. We took these samples to Brandine University to be tested. As the letter states, the meat was not chicken. The animal in question had some chicken genes, but obvious signs of gene splicing were detected. Some of the genetic material seemed to be from ostrich, and some even from turtle, or possibly snake. After considering the letter, the genetic findings, and conferring with his colleagues, Dr. Richard Payne concluded that chicken-like creatures could indeed exist. He also told us that probably only one company, New Dawn Biotech, was capable of creating such a thing. We contacted their labs in Alberta, Canada. Like KFC, New Dawn Biotech denied that they were involved in any such thing. THE UNCOVEROR will continue to dig on this one, and will update this story if we find out any more. By the way, KFC has always been pressure cooked, or baked. It was never fried. If what the letter says is true, then KFC is NOT FROM KENTUCKY, NOT FRIED, AND , MOST IMPORTANTLY, NOT CHICKEN. If you eat chicken rather than red meat some of the time you may help your health. If you're worried about your high blood pressure and you need some health info about your diet then a good medical search engine could prove informative.